Mr. Carr has done a wonderful job bringing his musical expertise and background in music education to the homeschool community. My daughter has grown so much as a musician because of the fundamental singing skills taught in Lux Venit. And she has fun at the same time! What a privilege for her to be a part of the rich Texas choral tradition! Lux Venit is an advanced choir experience for homeschooled kids. The quality of the training is phenomenal and on a level with expensive private professional lessons! Mr. Carr, the greatly experienced choirmaster, has a way with children to keep their attention and interest well. After 2 years, my girls, now aged 7 and 9, run out the door with anticipation to go to choir practice! The quarterly concerts are some events the whole family looks forward to. Come out and see the end result of their hard work at the last concert! Lux Venit came at the right time for our family. The price is doable and wonderfully gracious to large families. The alternate location is conveniently available for schedule changes. All of my children have learned so much. Clay and Chloe have flourished vocally. Logan's stage presence has improved dramatically. Joy has been brought into our home through the gift of song. Mr. Carr relays his knowledge skillfully within a short period of time. He also places the children in competition and prepares them successfully. I am so grateful for his skill, knowledge and commitment to his students. Lux Venit and the Carrs have truly been a blessing to our children and our family. Thank you, Mr. Carr! Lux Venit has been a welcome addition to our homeschooling activities. It is enriching in so many ways. My son, who wasn't overly enthused about joining choir, has done very well and even was courageous enough to brave a solo at the solo and ensemble contest. Mr. Carr makes the whole experience very enjoyable. My children practice the songs without prompting and the concerts have been superb. And the "creme de la creme" is that they sing more enthusiastically during the Sunday worship service at church. I highly recommend joining Lux Venit! Lux Venit Men's Choir was the highlight of our young teenage son's homeschool week! It taught him to be a "self-starting competitor" in the disciplines required to prepare for a class time that was productive. Our son also shared that Mr. Carr kept the choir going forward with lots of laughter! As a fellow professional choral music educator, I am so grateful for my children to have the opportunity to be a part of Lux Venit Choral Academy. When my family made the decision to home school, my one lament was that my children would not have a "school choir" experience. There is that, and so much more in Lux Venit. The caliber of musical performance is on par with the excellent music programs in our local public schools, which is especially impressive with such a low time commitment of one hour of rehearsal each week! The Lux Venit choirs not only learn how to sing well with Mr. Carr, but also how to read music. Mr. Carr is encouraging, kind, patient, and a wonderful musician. Our community is incredibly blessed that Mr. and Mrs. Carr had the vision to create and continue Lux Venit Choral Academy. Lux Venit gives solid classical vocal, sight-singing and theory to homeschool children. Life is so much sweeter with music. Music is so much sweeter with proper training. Lux Venit is a great way for your children to learn fundamentals of music and be trained to sing their best for their enjoyment and God's glory. We are so grateful for the opportunity to be a part of this choir. Mr. Carr has brought a high level choral experience to north Tarrant County. Our girls are challenged each week in class. They have fun playing "music" games and practicing. It's been such a blessing for our family. The TPSMEA All Region and Solo Competitions were the highlights of the Lux Venit program for our daughter who is a senior. We noticed so much improvement in her singing just within the first two months of classes. Mr. Carr is a dedicated and fantastic teacher; we highly recommend him. We were so excited that she made the All Region Choir; it was a wonderful experience for all of us. - David and Cynthia H.
Lux Venit is a rare opportunity for your homeschooled child to receive excellent vocal training in a Christian environment. Our son loves the Lux Venit choir. He relates well with Mr. Carr and has grown this year in musical aptitude and understanding. We are excited about the opportunities to learn and perform and compete in years to come. 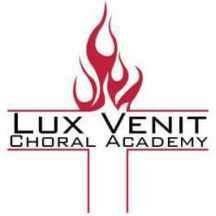 Lux Venit Choral Academy has been a wonderful experience for my daughter and for our family. She has learned so much from Mr. Carr and we have really enjoyed watching the entire choir develop over the year.